Earlier this month was the birthday of Ray Cooper. I'll not say his age, needless to say it's irrelevant to his playing. 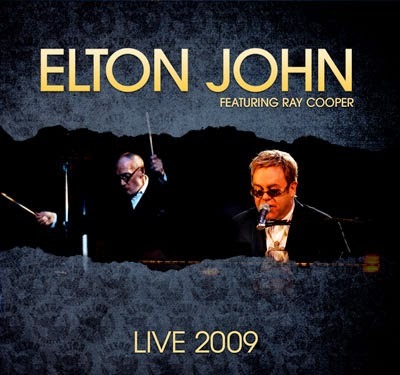 In honour of this anniversary, I dug out one of the early shows from the third age of his efforts with Elton. ...as we very lucky to have Concert Live record all six shows on this short European tour. The first show at the Royal Albert Hall wasn't lucky enough to be released in soundboard form but the subsequent shows were just as strong and at least early on in the tour were just as long. The tour was short and swift, a quick scoot down the highways and byways of France and Italy. A chance to get the oil flowing back to unfamiliar bearings and rings that might have, but didn't, seize up whilst being laid up. Concert Live always did a decent job, though they had trouble mixing audience and stage sound. When audience sound was turned up the stage sound became something like a badly tuned in radio. But those moments were brief and didn't spoil the overall quality. I'm singling out the second show from Galaxie dÀmnéville, 26th September 2009, as it has the longer setlist. I'll highlight some old favourites and the later additions to the setlist that had new spins put on them. First thing to be said about the opening half is the solemnity of the occasion. In fact, it's sombre and hovering just north of downbeat. Elton's mood was incredibly low, his slow speaking (mostly in French) was tempered with the need to entertain. The songs were the main act, they didn't fail to deliver. Due in no small part to the fact the set list was a triumph of variety and the exotic. Elton's voice at the start was rough, improvement was brisk though. The opening of The One was a masterclass of hope that delivered. It seemed to give Elton the nod to kick on and put his best fingers forward. Sixty Years On with his heavy left hand was definitely showing the best side, incredible vibrations reverberated long after the keys had been depressed and released. The great aspect of this setlist was how the 90's and 00's material was exhumed. Too long it's been airbrushed from the set, this time it was standing in line. The Emperor's New Clothes with it's marching solo showing no lack of confidence surrounded by classics like Rocket Man with it's MIDI heavy effects that used the technology to enhance the songs mesmeric trajectory. Weight Of The World continuing the life affirmation for desired life that has been realised. Blues Never Fade Away is where the culmination of all this striving for something positive to cling on to finally hits home. Dedicated as a tribute to the recently lost Guy Babylon it fitted perfectly on a number of levels. Firstly he played on the studio version, so the song will always have part of him. Secondly the lyrics are tailor made for that exact moment. A moment that when you listen to Elton speaking before it, you can't help be moved by the total genuine sentiment that seeps through the entire speech. If the first part was a struggle for answers, then by the end of the solo set we may have found some peace. But the peace in the theatre would be temporary. As soon as Ray appeared, Elton was suddenly buoyed. The appearance of a friend and musical confidant would drive the second half on into new lighter territory. Though the time away had created occasional bouts of uncertainty between the two, the hesitant cues created by absence but would be rectified by frequent presence together. Funeral For A Friend has one of the greatest piano intros created by anyone who has used the instrument as their canvas of choice. The steady progression and the quickly developing aura suddenly interrupted by Ray beating the last drop of sound out of the timpani. The assault is quick, loud but very comfortable until the vast range of emotions that is Tonight restores tranquility. The great thing about these shows as I alluded to earlier is how old and new mix well. The old get a makeover in some places too, giving them some 21st Century sparkle with a vintage heritage. Come Down In Time's light airy rhythm is accentuated by Ray adding shaker on the intro and vibes as the song progresses. The troika of Carla/Etude/Blessed is no juxtaposition but a the act of a magician. The terrific instrumental leads into one of my all time favourite songs, the melody hypnotises but sleep is kept away by the intensity of the songs message. Crazy Water has it's usual zany mix of alternating rhythms. Saturday Night's Alright is a masterclass of tambourine spanking, the call and response at the end has gently simmering conga's. Rank Films opened with a gong, Elton and Ray shows close with a swanky gong!